Filipa graduated from University of Évora in Portugal in 2012. During her degree she also spent a year studying at University of Santiago de Compostela in Lugo, Spain. Shortly before finishing her studies, among other externships, she completed a six-month neurology externship in a referral centre in Lisbon, where she developed a special interest in that medical area. 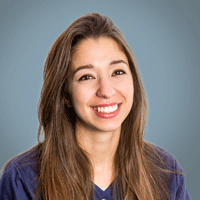 After spending a year working in a small animal practice in Portugal, Filipa has then moved to Newcastle, to work in a busy small animal hospital as a general practitioner. Filipa's areas of major interest include neurology and internal medicine. Filipa has completed a one-year mixed internship, then a one-year neurology specific internship at SCVS. She began her three-year residency in neurology in July 2017, studying towards her European Diploma in Veterinary Neurology.